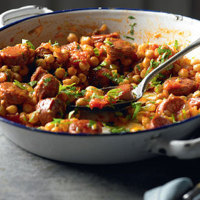 Fry the chorizo in a large, non-stick frying pan until it releases its oil. Add the onion, celery and garlic and cook until softened. Add the wine, tomatoes and seasoning to the pan and simmer for 15 minutes, stirring occasionally to break up the tomatoes, until the sauce has thickened. Stir in the chick peas and simmer for a further 5 minutes. Check seasoning, then garnish with chopped flat-leaf parsley and serve with a salad and crusty bread to mop up the juices.